Not everyone is thrilled over President Obama’s latest wave of the Antiquities Act wand to national monumentize Browns Canyon. The scenic river, surrounding property and rock spires in Chaffee County that are a mix of federal and state lands, will become further mired in the federal bureaucracy that is the Bureau of Land Management when Obama wields this executive power on Thursday to make it so, from Chicago. Enviroweenies demanded that Obama proclaim the monument to show his support for wildlife and the great outdoor experience. There was no threat we knew of to rafting, hiking, fishing, hunting or ranching in the area. Some folks at the National Wildlife Federation insisted that bobcats and elk needed protection, we guess because there’s only about 1.5 million of the cats left roaming the country plus about a million elk. But greenies demanded that government needs to preserve nature’s beauty, because it’s so darn good at everything else it does. 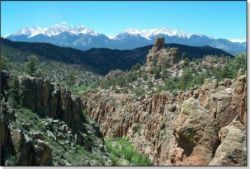 Enviroweenies fired back, comparing apples and oranges like they always do, claiming Lamborn is a hypocrite because he formed a study group eight years ago to determine if Pike’s Peak should be declared a national monument. We would link their statement as well, but their argument was pretty weak, and we just don’t feel like it. U.S. Sen. Cory Gardner took the high road, as full federal authority over the canyon was one of the few things Mark Udall worked to achieve in the state. You remember him, the former senator who Gardner spanked like a petulant child in the election? That’s the real problem here, folks. It’s not so much what Obama did, it’s how he did it. The Antiquities Act ranks as our least favorite law. Ever. It might have been a great idea 100 years ago, but rank and rampant abuse of the law beginning with the Clinton administration has turned the Antiquities Act into an antiquity. The problem is that Obama did this without local input to preserve local interest and protect private property. He did it without us. Again. « PRIMARY RUMORS: DeGette Pisses Off Pro-Israel Crowd, Primary Challenge to Follow? There was a fight over the (artist) Christo "Flags over the River" project. This will put an end to the litigation over that project. In my Conservative opinion – the art project was a conservation nightmare that is good to be dead.